Dinosaur Themed Balloons for Birthday Party Decoration! These helium quality dinosaur balloons come in assorted bright colors. Cute T-rex and Brachiosaurus dinosaurs are printed on all sides. Dino balloons are always a big hit for dinosaur themed birthday parties! * Assorted colors: green, yellow, red, blue, orange, purple. 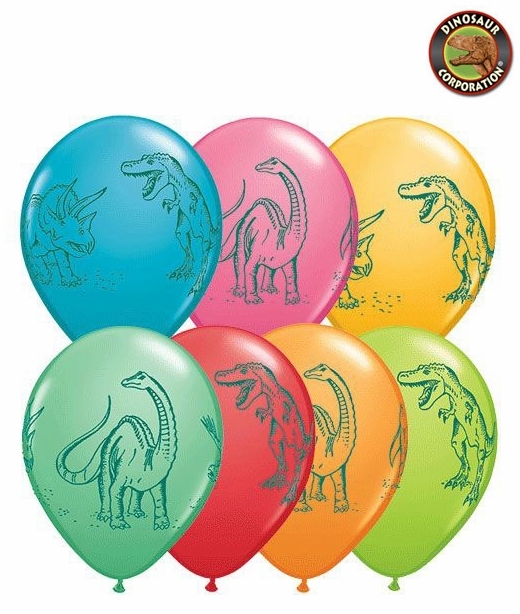 * 6 dinosaur balloons featuring T-rex, Triceratops and Brachiosaurus per pack.